Lab2 is an add-on to LabView allowing to simulate a large variety of experiments in ultrafast optics in a very comfortable and intuitive way. 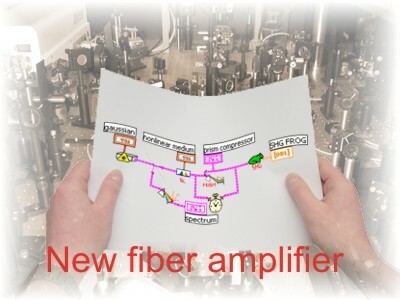 Several users have contributed special modules that make Lab2 even more attractive, as they allow to study a number of laser-matter interactions. They include diatomic molecules (Lab2 solves the time dependent Schroedinger equation), three level systems (Lab2 solves Maxwell Bloch equations) to name but a few. Lab2 was born at the Institute for Optics and Quantum Electronics (IOQ) in Jena in 1998. Its headquarter is now - since fall 2004 - at the Institute of Applied Physics in Bern (Switzerland). We do hope that you'll find it useful. The latest version is version 5.0 and it runs with LabView 8.5 and higher.